That electrical charge, the team says, could be quite useful. 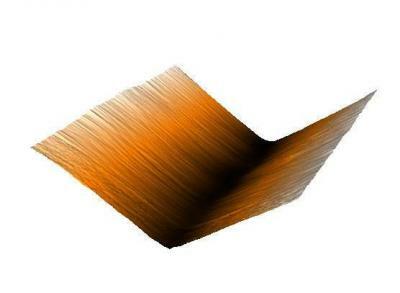 It could, for example, be used to direct nanoscale self-assembly. The charged ridges attract particles with an opposite charge, causing them to assemble along crinkle ridges or valleys. In fact, Kim says, particle assembly along crinkles has already been observed in previous experiments, but at the time the observations lacked a clear explanation. Those previous experiments involved graphene sheets and buckyballs— ball-shaped molecules formed by 60 carbon atoms. Researchers dumped buckyballs onto different kinds of graphene sheets and observed how they dispersed. In most cases, the buckyballs spread out randomly on a layer of graphene like marbles dropped on smooth wooden floor. But on one particular type of multilayer graphene known as HOPG, the balls would spontaneously assemble into straight chains stretching across the surface. Kim thinks flexoelectric crinkles can explain that strange behavior. Similarly, strange behaviors have been seen in experiments with biomolecules like DNA and RNA on graphene. The molecules sometimes arrange themselves in strange patterns rather than flopping out randomly as one might expect. Kim and colleagues think that these effects can be traced to crinkles as well. Most biomolecules have an inherent negative electrical charge, which causes them to line up along positively charged crinkle valleys. It might be possible to engineer crinkled surfaces to take full advantage of the flexoelectric effect. For example, Kim sees a crinkled surface that causes DNA molecules to be stretched out in straight lines making them easier to sequence. "Now that we understand why these molecules line up the way they do, we can think about making graphene surfaces with particular crinkle patterns to manipulate molecules in specific ways," he said.